Since its founding in 1906, Suffolk University has made a commitment to provide its students with unparalleled experiences and opportunities. Explore our unique downtown Boston location, and then consider the many paths your life might take from here. We’re excited that you want to learn more about Suffolk, and we think you’ll like what you find. Whether you’re looking into colleges or graduate school programs, we’re eager to help answer your questions and walk you through the application process. As you start your academic journey, you’ll find a supportive network of faculty, staff, and classmates ready to help you succeed. We let you chart the course your education takes, from traditional classes enriched by real-world experiences to research projects, study abroad, internships, and more. Suffolk places you smack in the heart of Boston, with countless activities at hand and unexpected opportunities around every corner. Whether you’re commuting or living on campus, you’ll find yourself making connections and getting involved. When you graduate from Suffolk, you join a strong alumni community that will continue to enrich your life. More than 70,000 living Suffolk alumni stay connected with each other and the University, supporting their alma mater—including current students—in a whole bunch of ways. Whether you're a student-athlete, an alum, or just looking for the latest game times, you'll find plenty of excitement in Suffolk athletics. We believe that athletic participation and competition are important aspects of the college experience. Lessons discovered through athletic participation contribute to success in a student's college years as well as in their future professional and personal experiences. Each graduate and friend of Suffolk University has the potential to make Suffolk even greater. We encourage giving at every level, with an emphasis on scholarships for a new generation of Suffolk students. Thank you so much for your support. This type of gift arrangement allows you to direct gifts to Suffolk for a specified period of time and, in turn, receive either a charitable deduction now for gifts made in subsequent years or a reduction in gift or estate taxes on property you wish to pass to heirs. Under the nongrantor plan, you irrevocably transfer assets to a trustee and provide that payments be made to Suffolk for a certain number of years (or until the end of your or another's life). Then the principal is distributed to your children, grandchildren, or other heirs. The principal passes to your heirs at greatly reduced gift- and estate-tax rates and sometimes escapes them altogether. The charitable lead trust may appeal to individuals who wish to make a gift but retain the property in their family. 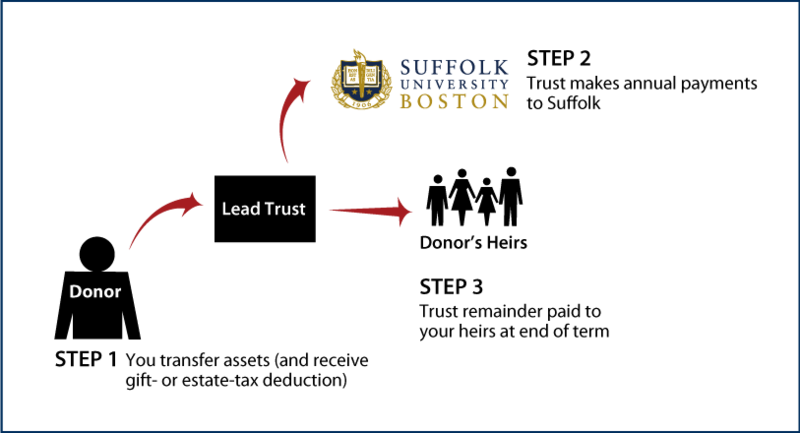 The payments (gifts) to Suffolk must be an annuity interest (fixed-dollar amount annually) or unitrust interest (fixed percentage of the fair-market value of the trust assets determined annually). There are no minimum or maximum payout rates. The charitable beneficiary must be an organization described in the appropriate sections of the IRS Code. 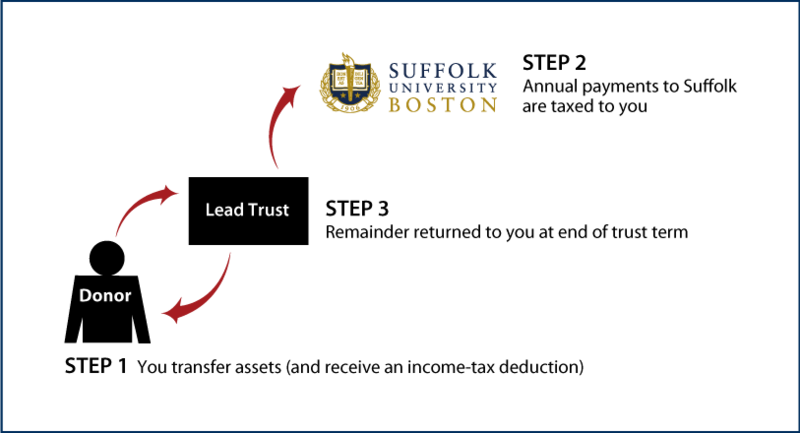 Suffolk is a qualified charitable organization.